Blue Rain’s Annual Celebration of Contemporary Native American Art Why not collect the best? 505 982 7000 201 Galisteo St. Santa Fe, NM 87501 www. August 3 - 28, 2011 | Opening reception: Friday, August 5, 5:00 - 7:00 p.m.
A unique sale of Native American art from the homes of top collectors! “UNDERGROWTH” ~ Color pencil/gouache on toned paper ~ 20" x 14 1/2"
j s a u e r g a l l e r y. c o m info@jsauergallery.com “A GENTILE CONVERSATION” ~ Glass wall sculpture ~ 90" x 44" x 3"
Ron Denson (Professor Ithaca College, Ithaca, NY) "Off the Reservation, or, When 'Indian' Art Becomes Fine Art: A Modest Collector's Perspective"
The best information and the largest selection of Pablita Velarde and Helen Hardin work - anywhere! Returning to our space below the La Fonda Indian Shop & Gallery. 100 E. San Francisco St., Santa Fe Open Daily 10 a.m. to 6 p.m.
FOR MANY YEARS now, the Santa Fean has had the distinct honor of preparing the official magazine for SWAIA’s Indian Market. It is the goal of this issue to take you beyond booths and parties, and take you into the spirit of the Native American artist. We are very proud to bring you images and words that make Indian Market come alive and allow a deeper understanding of the culture and talent that goes into each piece. Actually, we don’t limit ourselves to just Native American artists. In the issue, you will also become acquainted (in the art section) with a spectacular sampling of art from throughout Santa Fe and with the variety of traditional and contemporary works that this fine art city offers. The common denominator for almost all forms of art is that it’s made with one’s hands. The photos in the pages that follow show the loving and careful use of hands to form these amazing pots and wonderful pieces of jewelry, but all art forms and all artists use their hands in innovative, creative, and useful ways to create the art that we love. There is nothing quite as interesting as watching an artist use their hands as tools or to manipulate tools to create interesting visual effects. Brushes, knives, sticks, and rocks are just some of the tools most often used and seen. Recently, while taking a ceramics class from Heidi Loewen of Heidi Loewen Porcelain Studio, Heidi herself had me using all kinds of tools, particularly my hands, to form interesting patterns and shapes. Obviously, the wonderful bowls you will see in this issue have very practical purposes, and much of the Native American art has spiritual implications. I would like to suggest that all art forms have a practical application in our lives as they give our minds and our souls a different place to live. When the challenges of our lives begin to overtake us, these beautiful creations remind us of what’s really important, and they put us in touch with the world that is bigger than ourselves. While many art forms transport me, Native American art consistently reminds me of the timeless journey between the past and the future. Enjoy the journey. In this issue, we are featuring Vueteligent. By scanning this symbol with your smartphone, you will immediately be connected to Santa Fe’s best calendar and our website. 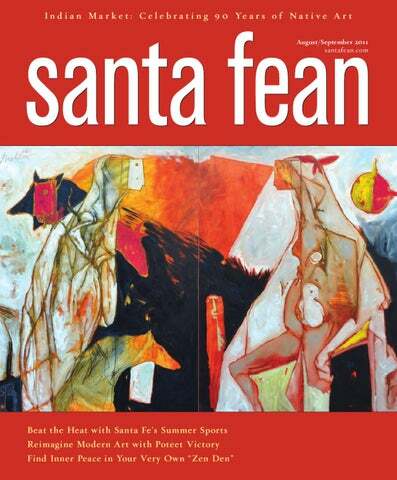 Santa Fean (ISSN 1094-1487) is published bimonthly by Bella Media, LLC, 215 W San Francisco, Ste. 300, Santa Fe, NM 87501. 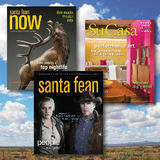 Periodicals postage paid at Santa Fe, NM and additional mailing offices. Postmaster: Send address changes to Santa Fean P.O. Box 469089, Escondido, CA 92046-9710. Tr ail 53 Old Sant a Fe Plaza Upstairs on the Mexico Sant a Fe, New 505.982.8478 com shiprock sant afe. Downtown Santa Fe’s only luxury residence club was designed for you—someone who appreciates the ﬁner things in life. Enjoy a luxurious vacation home with ﬁrst-class service, zero maintenance hassles and an ideal location just a stroll from the Plaza—all for a sensible price. Located just three blocks from the Plaza on the corner of Catron Street and Grant Avenue. Ownership from $130,000 Pricing subject to change without notice. Owners receive a 1/8 th undivided, deeded interest in a Club residence. This advertising material is not an offer to sell nor a solicitation of an offer to buy to residents of any state or jurisdiction in which registration requirements have not been fulﬁlled. All information is subject to change without notice and not guaranteed. Don Stinson, Wyoming Energy Romance, oil on linen, 18 x 24 inches. ÂŠ Don Stinson, courtesy Gerald Peters Gallery. ONE OF THE MOST INTERESTING AND COLORFUL INDIAN TRADING COMPANIES IN THE WORLD can be found in downtown Gallup on historic Route 66. Established as traders on the Navajo Reservation since the turn of the century, the Richardson family continues a long and historic tradition in Gallup, New Mexico. The atmosphere inside recalls the old trading days, when Navajo families might travel for several hours and then spend an entire day at the trading post, selling wool, trading blankets and jewelry to the trader for food supplies and clothing, and exchanging stories with friends or neighbors seen only on these occasions. Wood floors, pew-like benches, cases full of polished silver and turquoise jewelry, piles of richly-colored Navajo rugs, and the sweet smell of aged leather saddles fill the interior of the store. Indian pottery, baskets, beaded items, artifacts hundreds of unique, one-of-a-kind Indian art pieces are displayed prominently throughout the store. Hot springs, lakes, waterways, art, history, shops, galleries and Spaceport America await you along the Geronimo Trails Scenic Byway ... an oasis in the desert! September 17th, 2011 Buy your tickets now! We salute John Vazquez for being named to Barron’s “Top 1,000” Financial Advisors list. Putting clients first is why John was recognized as being one of the very best Financial Advisors in America in 2010 and 2011.
eNd of tHe trAIl SAle Highlights of our 2011 Indian Market Show will be the introduction of superb new works by nationally recognized master Navajo sculptor Alvin Marshall and increased concessions on our legendary art offerings in conjunction with our eNd of tHe trAIl SAle. As the end of our long and successful business experience nears reality we wish to share our appreciation with our art patrons that have contributed to our 30 year history as one of Santa fe’s most respected and cherished galleries. tHe eNd of tHe trAIl SAle is providing serious collectors and those introducing art into their lives a most unique opportunity to acquire art treasures. We need your help! Please Donate or Mentor. Call 800-545-6843 or visit our website for information on how you can become a mentor or Youth Leadership supporter: www.futuresforchildren.org. If you wish to sponsor a Youth Leadership Program or mentor a child, when you contact Futures for Children please mention code: SIM11, and you will receive a free gift. FUTURES FOR CHILDREN 9600 Tennyson St NE Albuquerque NM 87122-2282 Where Native Youth become Tomorrow’s Leaders! HA.com/6062-38003 Free catalog and The Collector's Handbook ($65 value) for new clients. Please submit auction invoices of $1,000+ in this category, from any source. Include your contact information and mail to Heritage, fax 214-409-1425, email catalogorders@HA.com, or call 866-835-3243. For more details, go to HA.com/FCO. D A L L A S | N E W Y O R K | B E V E R LY H I L LS | PARI S | GE NE VA TX Auctioneer licenses: Robert Korver 13754; Mike Sadler 16129; Andrea Voss 16406. This auction subject to a 19.5% buyer's premium. 12-30-03 much of what I write, the poems that is, are stones I litter the dusty roads with so kids can pick them up readily to throw at tanks. Much of what I write are like bullets to reload the rifles of peoples fighting for their land and their way of life. Much of what I write is my way of revealing to me what CEOs want to conceal— my words the black blindfolds I cut loose and when I do, I find myself in basements, in strange places I have never been, and outside I hear gunshots and children running from dictators. photo identification. SWAIA’s standards are for the buyer and artist; they help ensure the uniqueness and high quality of Indian Market. jewelry Native American jewelry is one of the most distinct and delightful of all the art forms. Buyers should be aware of the range of materials today’s jewelers use, including stones and setting techniques. SWAIA requires full disclosure of some materials, including stabilized stones. Most machine-made, imported, or non-Native components are not allowed. allowable 1. Organic and stone materials a. shell and natural organic materials, such as bone and wood; natural stones, such as turquoise, coral, lapis, etc. ; other natural untreated stones and gemstones; and ceramic medallions and/or objects set as stones. b. natural pearls, finished stones, and gemstones in cabochon and faceted shapes set in metal settings. 2. Metals—all non-plated metals are allowed and must be clearly identified. For example, iron, silver, brass, gold, etc. Gold must be 14K or higher. 3. Chip inlay in the ratio of no less than 85 percent stone, 15 percent adhesive. No powder is allowed, only chips. allowable findings Allowable findings for the purpose of Indian Market are defined as “an ingredient part of the finished product that adapts the product for wearing or use.” Examples of allowable findings are: jump rings, earring backs, clasps, barrette clips, money clips, hooks and eyes, leather for bolos, conchos, and buckles. For shell and bead makers only: single bead/cone combination to finish ends of necklaces or earrings. allowable with disclosure 1. According to the New Mexico Indian Arts and Sales Act, stabilized turquoise must be disclosed to the consumer. 2. Commercially available coral from temporary strands must be natural and undyed. The use of coral can only be used in combination with a handmade item or items. 3. Commercially available glass beads can only be used in combination with a handmade item(s). a. Multiple-strand glass-bead necklaces strung in the tribal tradition of the maker are allowed. 4. Cast jewelry to include sand, cement, lost wax, and tufa. a. Editions are limited to 25 and must be signed with the artist’s hallmark and numbered. b. Rubber molds are allowed, as long as edition requirements are adhered to. 5. Commercial chain may be used (as a finding) with handcrafted items, but may not be sold individually. 6. Fabricated, laminated-pattern sheet metals such as mokume- gane can be used but must be disclosed to the consumer. 7. Precious metal clay. IN MUCH THE SAME way that various Caucasian boxers of the past half-century have served as the next Great White Hope of their sport, Tony Abeyta seems to have been invested, by Natives and non-Natives alike, with the expectation that someday, tomorrow if not sooner, he will assume the status of Fritz Scholder, Allan Houser, and Dan Namingha. Abeyta, the 46-year-old son of painter Narciso Abeyta and sculptor Elizabeth Abeyta, the product as much of Western art programs (a BFA from the Maryland Institute College of Art, years of study abroad in the south of France and in Florence, Italy, and graduate work at the Chicago Art Insitute) as of his Native influences, like Gallup, where he was born and raised, and the Institute of American Indian Arts, where he received his B.A., has a shot at transcending his Native roots (he is Navajo) while still clearly being of them and in them artistically. Versed in many media, his chosen field has been painting. Inclined toward largescale abstract and figurative depictions of the Navajo underworld and Navajo spirituality, and toward plants and landscapes, Abeyta renders many of his works with sand, with encaustic wax and collage, with layer upon layer of vibrant color or a Guernicalike combination of black, white, and gray. It’s a style and an oeuvre that have caught on not only with influential collectors and critics but with museums and institutions as renowned as the Heard Museum and the National Museum of the American Indian. Easygoing, articulate, socially nimble, and unassuming, Abeyta lasted a mere two Indian Markets before being snapped up by savvy gallery owners. Nevertheless, Market is one of his busiest times of year. At work on as many as half a dozen paintings at once in the roomy, second-floor studio he maintains less than a block off the Plaza, Abeyta has recently added jeweler to his expansive skill set. Left: Pueblo Labyrinth, oil on canvas, 24 x 30"; below, three of Abeytaâ&#x20AC;&#x2122;s most recent pieces of jewelry, made of sandcast silver and turquoise. not that Say what? kind of painting, like the big red abstract one. Your jewelry’s pretty straightforward too—not at all of the Say what? variety. Yeah, it has a modernist feel but it’s also ancient. The silverwork mirrors the paintings. They’re all sandcast. They’re a little masculine and bulky, but that’s my style. I don’t do filigree or dainty. I tend to like large stones with a matrix. And it’s an extremely gray American turquoise. Which I love. How’s it been working so close to downtown and all these people? I’m really loving it, though it has its up and downs. Part of me likes all the people dropping by, but it also distracts from my creative muse. I’m trying to keep that equilibrium of solitude. But how do you do that in the middle of where it’s hard to park your car? Has that been more of a challenge lately—finding the time to do the jewelry, paint, hang out with friends, and be a single dad? I’ve been pretty prolific. But the key is balance. To keep inspiration going I have a lot of irons in the fire. I also stay creatively inspired by taking downtime—going biking, going hiking. What are your thoughts on Indian Market? It’s important, and I support SWAIA. Most of my friends are out there; that’s their key time. But a lot of what I do isn’t booth-friendly. (Most of my paintings are too big.) I did it for two years. My first year was great. I established a relationship with clients. I learned how to put together a body of work and how to deal with people patiently. want to live there. It doesn’t have the support system. Plus, here there’s such a magnetic environment for art collectors and an infrastructure for artists. I’ve lived and worked in New York. It’s difficult and expensive. It’s space restrictive. And Santa Fe’s not restrictive on your career? On getting more exposure? It’s a perfectly legitimate place to be. But by definition, I’m a regional artist. That’s the cultural significance of my background. And how has being here influenced your work? All the places I’ve been in have reflected my palette. The black and white came out of Chicago. New York focused me on content and that art can be whatever I want it to be. And you can’t do New Mexico landscapes living next to the water in Italy. Which is why you’ll see me painting Pedernal more than Venice or Italian landscapes. Untitled, oil on canvas, 46 x 36"
How has your work changed from where you started out? I still respond to color and textures. I still like the process, the materials, but I now have total confidence that I can start a painting and finish it. But I still feel as though I need to add more spice and flavor to what I do. Where does your imagery come from? Sometimes you have to go through 12 paintings to get to that 13th one that’s the breakthrough. The difficulty is convincing people that not everything is a masterpiece. The muse, inspiration, isn’t always there. So I wait. As far as the images themselves, the cultural parts draw from the traditional belief systems. But I’m not a traditionalist. You’ve lived and worked in so many other art cities—New York, Chicago, Florence. Do you plan on staying here in Santa Fe? I do tend to pick up and move about every three to four years. But Santa Fe’s always been my base camp. I have a lot going on here and I’m still inspired. And I still get away a lot. I go to Chicago, where my son’s in school, or to New York, or to Los Angeles to see my girlfriend. And wherever I go, I’ll see other work and other galleries. That’s all great but New Mexico, it’s a cultural attraction. There’s the Navajo, the Pueblos, the Rio Grande. The light, too, is paramount. That’s all kept me here. Did you start out as a painter? For a short period I wanted to sculpt. In the painting, I was having a hard time with color and getting the images across. So I started drawing in Baltimore. It came out huge and fast. That was the beginning of tapping into my subconscious. I got a lot of black-and-white images out of that. Unfortunately, I lost them all in a fire. But they gave me insight into the possibilities of information. You just have to tap it and follow where it runs. Really good art isn’t planned, it happens. You are a conduit and you’re drawing on your resources. OUR OBSESSION WITH HAIR and its reflection of personality and status go back millennia. From the ancient Egyptians’ elaborate wigs to Marie Antoinette’s 18th-century pouf to Justin Bieber’s fringe, hair is a mode of expression and identity. But finding the perfect coiffure can be daunting. For many, the right stylist is worth his or her weight in gold (or hair extensions). Being a place that fosters individualism, it’s not a surprise that Santa Fe’s boutique salons sport some great talent, not to mention a bevy of progressive beauty services and products. And while there’s an unspoken rule that a client’s relationship with his or her stylist is a monogamous one, if you’re not currently in a serious relationship (or if you just haven’t found the right fit yet), check out the following salons, which are some of the best Santa Fe has to offer. Run by the husband-and-wife duo of owner Angela Del Mar and manager Kevin Wilson, Salon Del Mar (1225 Cerrillos) offers a warm and sophisticated vibe that the couple describes as “New York City meets the Southwest.” Having worked in the hair industry for 21 years in cities like Sarasota, Seattle, New Orleans, and New York, Del Mar fell in love with Santa Fe and opened her stylish Railyard District space three years ago. She credits much of the shop’s success to a team ethic shared by her, Wilson, and stylists Vanessa Perez and Chelsea Tang. The salon’s ambience and amenities—organic refreshments, free wi-fi, music by DJ Maynard Del Mar (Angela’s brother), and walls dressed with art and photography by local artists—create a fun space for primping. Stylists tend to their customers at Rock Paper Scissor (this page, top left, and opposite page, top right), Chop Shop (right), Adorn (below left), and Salon Del Mar (opposite page, bottom two photos). For those looking to knock out hair, nails, and waxing in one visit, check out Rock Paper Scissor Salon Spa (500 Montezuma, in the Sanbusco shopping center). Owned by Melodi Wyss-Feliciano and her husband, Aaron Feliciano, this spacious, lavender-walled spot is an airy respite for the weary (and hairy). Clients can stay up to date on the latest beauty trends by watching RPS’s online video series called Hot in My Salon. Another bonus of shelling out for services here is that RPS has a strong philanthropic track record, and, rather than spending money on advertising, it puts that money toward health care for its employees, resulting in low turnover among its stylists. If you’ve ever found yourself coveting the balayaged tresses of Gisele Bündchen or Sarah Jessica Parker, then a visit to Adorn Hair Studio (1600 Lena, Suite D) is in order. Owned by Christie Haynes, Jeanna Gienke, and Lori McDaniel Whitmire, the salon’s attentiveness to clients’ individual needs―—matching their look to their personality through hair color, extensions, or a precision cut―— is among the reasons this popular spot has such a devoted following. At Lotus Beauty (845 Agua Fria), the focus is on a natural, holistic approach to maintaining and enhancing one’s appearance. For customers weary of the chemicals used in hair treatments, Lotus (which also offers manicures, pedicures, facials, and waxing) promotes organic products and works with ammonia-, sulfate-, and paraben-free materials. The salon is also known for doing feather extensions. Johnny & Jane’s Chop Shop (317 S Guadalupe) has a vintage barbershop appeal but is a hit for its edgier looks—―a― lthough owners Johnny Akers and Laura Jane Rivera note that their full-service salon offers everything “from the extremely conservative to funky.” Akers is Chop Shop’s go-to guy for men’s cuts, ladies’ short cuts, and “making blondes blonder,” while Rivera specializes in, say, retouching a starburst-pink head of hair. The only request the pair might not accommodate is “anything resembling an early ’90’s prom ’do. No ribbon curls!” Consider yourself warned.